After meeting up at the Carter road promenade on a Saturday evening;the first thing on agenda was to decide on a dinner venue. We had our experiences at the Burgs (I think all veggie burgers taste same), Greko ( super food), the momo place etc in the past and this time we wanted something desi. 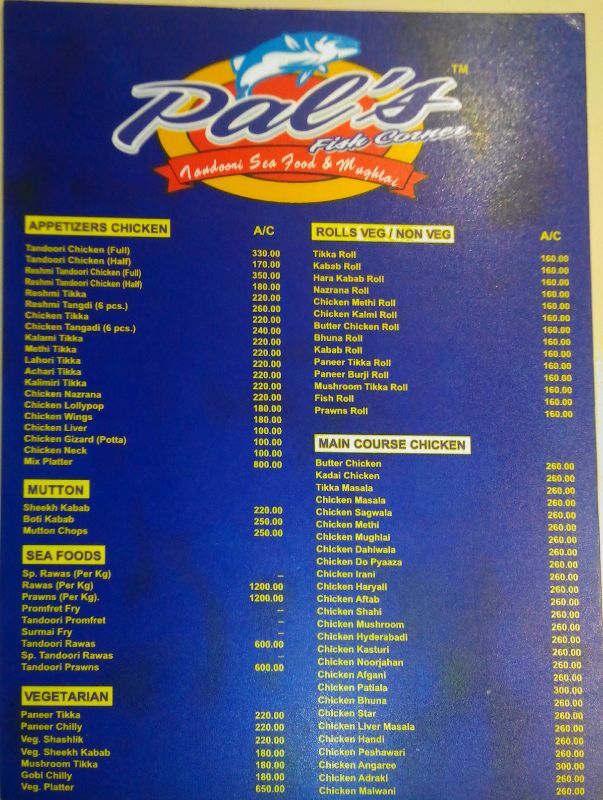 I suggested them Mini-Punjab( 16th road junction, the KFC lane ) which I had heard about as a VFM (value for money) eatery, but it was found under renovation and we quickly made our way into Pals Seafood Corner next door. Two of us were veggies and one not, so we scanned their menu before we entered,they had plenty of options. From the facade of it; the restaurant looks like a Dhaba with a cook putting up a ‘roomali roti’ show right at the entrance but they do have a 25 seater A/C cubicle on the mezzanine. We quickly ordered Mushroom and a Paneer tikka rolls each and a Chicken Kalmi tikka to begin with.For the mains we just wanted to try their Dal Makhani with some rice,steamed rice would have been ideal, but we ordered plain biryani rice to bring some novelty. 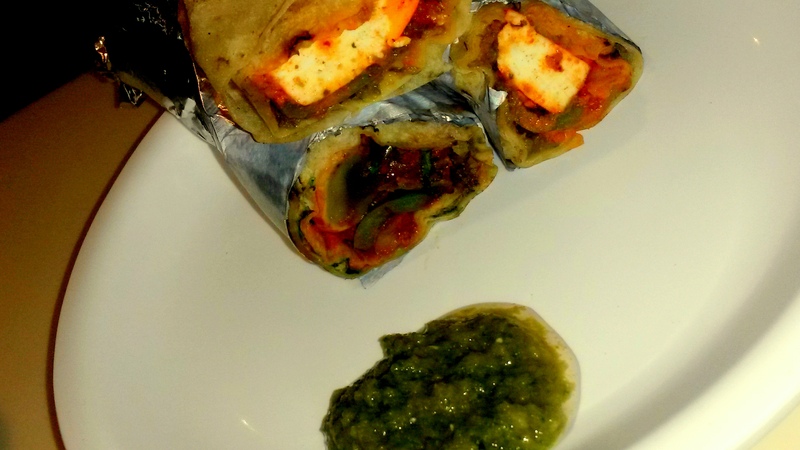 Both the roles came in a soft roomali wrap and the tandoori flavour in the paneer and mushrooms had completely seeped in. The Kalmi tikka was succulent and aromatic,my friend declared. Moving to the mains the dal makhani disappointed with lack of a flavour and it was hardly ‘makhani’. The biryani rice we expected was aromatic steamed rice with saffron/Kewra scent, but this was coloured rice tossed in copious amount of birista (deep-fried onions) and the oil showed. Meal for 2 at Rs 650 in Bandra is economical and I would certainly recommend it for their tandoori items and their rolls. 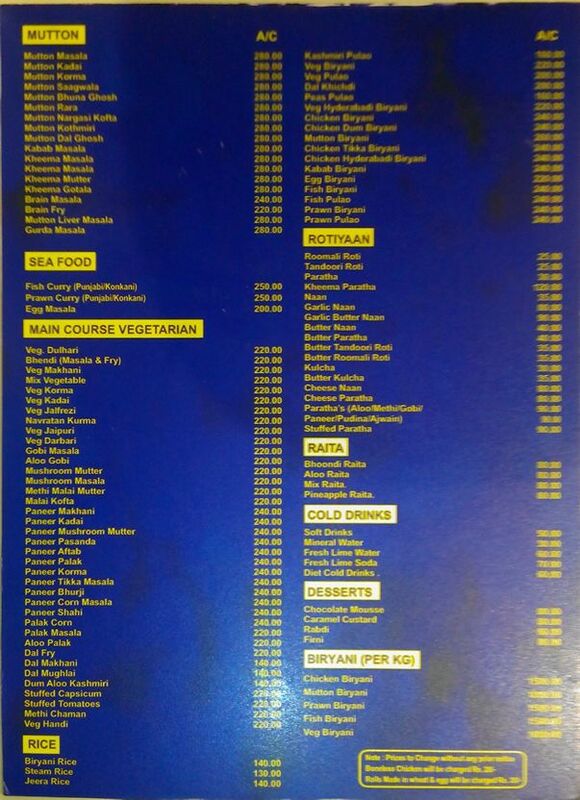 P.S: Firstly no onions were served with the food, they could have easily; given the menu prices. Secondly what they served was shredded cabbage and beetroot, looked extremely unappetizing , almost ‘goat-feed’ like.